My first piece in this months issue is an interview with Irish designer Rebecca Marsden. I have worked with Rebecca on a number of occasions and I only LOVE all of her collections to date so I was delighted to interview such a talented and creative person. Not to mention the front cover of this particular issue of 10TEN Magazine features a piece from one of her collections. 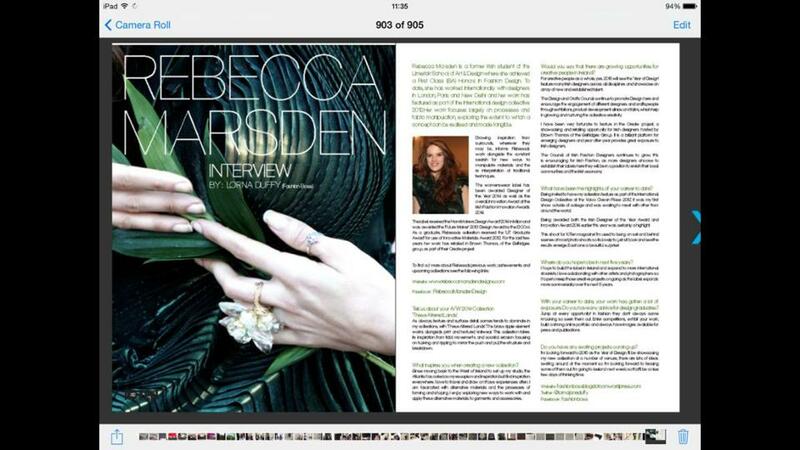 In this interview Rebecca tells Fashion Boss and 10TEN readers about all of her achievements to date, what inspires her, growing opportunities in the Fashion Industry and where she hopes to be in the next five years. Click here to read the full interview. My second article is full of festive and fashionable inspiration. It’s time to let the champagne flow, Christmas party season is finally here – and sometimes your LBD or your LWD just won’t do. I’ve chosen a few of my favourite fashionable festive party looks that will make you stand out in a crowd.Click here to read the full article for some festive inspiration. 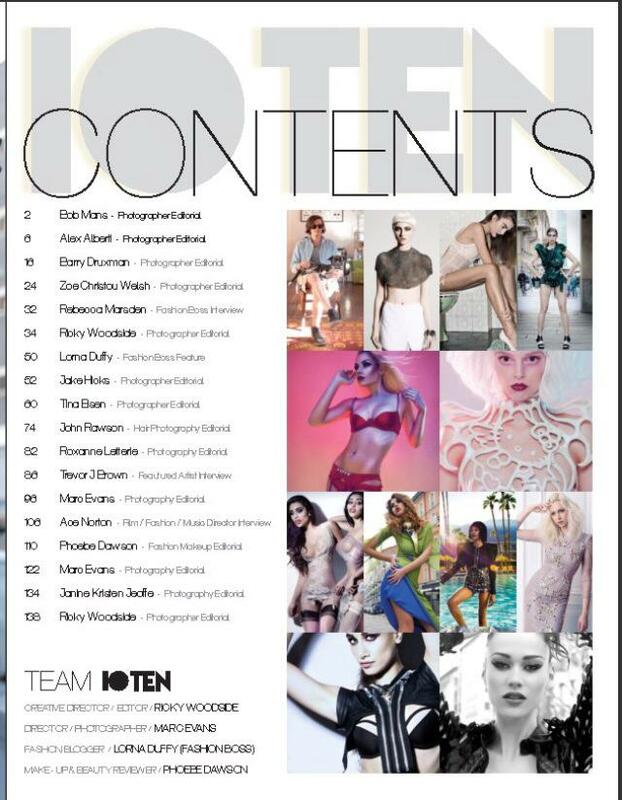 10TEN MAGAZINE is a high end fashion industry publication for Designers, Photographers, Fashion, Hair, Make-up,and Stylists from all around the globe. 10TEN began when two creatives Ricky Woodside and Marc Evans joined forces. With Woodside’s strong background in graphic design and love of photography and Evans’ love of Fashion Photography and with 25 years of industry experience they created this high end fashion industry publication. Ricky is a professional Graphic Designer and Fashion Photographer who has been working in both industry’s for 18 years. He shoots fashion, editorial, fitness, hair, beauty and make-up. His work has taken him to the UK & Europe. Woodside’s design work has spanned across many top agencies and magazines such as Free Flow, Flawless and now 10TEN. He has an edgy and unique contemporary style with a high-end retouching techniques. For more about Ricky Woodside and his work click here or follow him on Facebook here. At the age of 8 Marc knew he wanted to become a photographer. After completing a 3 year apprenticeship in North Germany he started working freelance in Germany and England. His career to date has brought him around the world and he is now based in Milan. For more about Marc Evans and his fashion photography click here or follow him on Facebook here. Thanks for the follow on Twitter, dear! I like finding fellow bloggers. Congrats for the featured article! Thanks Lubka. I will check yours out now.